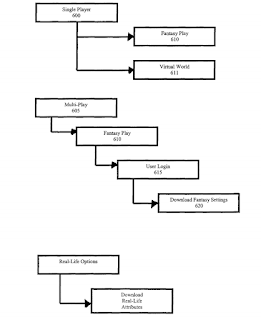 The ‘561 patent applies to fantasy sports and covers a networked system that creates a video game sports team based on at least part of a fantasy team roster. The system includes a server so the game team based on the fantasy roster can be used in online gaming or updated as the fantasy roster is updated. The real life actions of players on the fantasy team roster impact the play of the video game team during console play. A video gaming console and related network interfaces with a server computer hosting an online fantasy sports game. 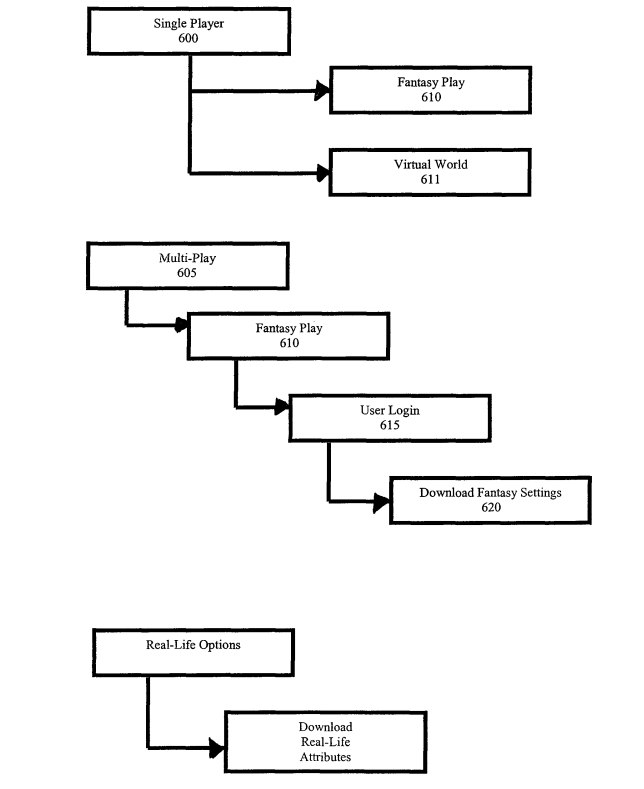 The video game machine acquires a fantasy team roster of the fantasy sport game over a network that includes the Internet and the video game console is programmed to create a video game team using at least a portion of the fantasy team roster. The video game team created is playable on the video game console. transmitting a fantasy team roster associated with a particular fantasy team to the video game console, wherein the video game console is programmed to create a video game team including a plurality of video game characters corresponding to at least a portion of the members of the fantasy team roster to be played in the sports video game on the video game console, wherein the video game characters of the video game team are associated with the same real-life athletes that are associated with the fantasy team members of the fantasy team roster transmitted, wherein the fantasy team owner is not one of the real-life athletes engaging in the real-life sporting events who are associated with the fantasy team members.